In interior design, a mood board is a large board prepared for the client. It is a visual representation of what a newly designed room will feel like, or what the room’s “mood” will be. This can include fabric cuttings, pieces of tile, pictures of furniture, paint color samples and anything else that the room’s finished design plans to contain. 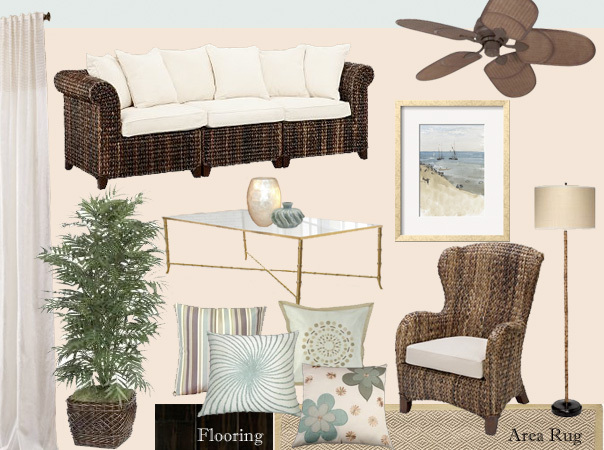 I prepare mood boards for my clients to show them how items in a room relate to each other. When I present a mood board to a client, I explain why I have chosen each item, which is always based on the client’s taste and the overall intended purpose of the room. Having the same image of the goal we are working toward is what makes it easier for the client and me to make any changes or adjustments to the design. The mood boards I share on my blog are from past clients of my Design Services or DIY Design Service. While I will happily share a paint color name, I can’t give the complete source list of furnishings to my blog readers out of fairness to the original client who paid for the design. Want some free interior design? At the beginning of every month, I post a free, fully sourced mood board on the CARO Interiors Pinterest boards. 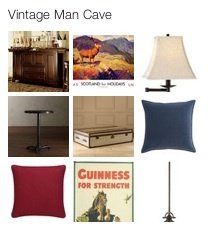 Every item on the Pinterest mood board is linked back to its retailer to make shopping and decorating easy for you. Use the free mood board for a little or a lot of inspiration, but each free mood board is only up for one month. Once we change our calendars, the old board is gone forever. Don’t miss a single free design! 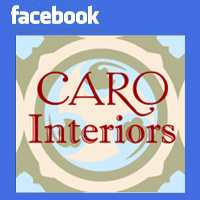 You can follow CARO Interiors on Facebook, Twitter and Pinterest to see when each new design idea is posted.